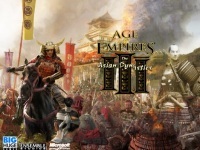 Age of Empires III: The Asian Dynasties is the second expansion pack includes civilization gameplay in China, India, and Japan. In this demo version, player will play the Japanese civilization. Age of Empires III: The Asian Dynasties was developed by Ensemble Studio and published by Microsoft Games Studios in October 2007. The game was released for Mac users in the next year. Besides following the gamerule from the original game, it adds more content based on the title, histories from Asian countries once upon a time. Like common real time strategy games, it features resource-collecting game rule while protecting the base from the attack of enemy troops. The ways to control units are also more and less the same with other RTS games, ie by clicking/dragging the units and then right click on specific position to move. Every building has their own function including civilization expansion and army creation. Nation can trade with other nations as well as cooperating in military purposes.